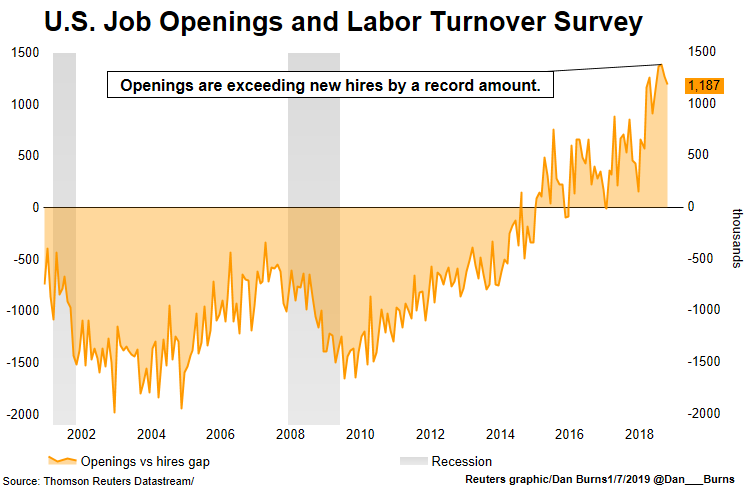 Job openings are outnumbering unemployed workers across increasingly wide swaths of the U.S.
As a result, businesses are being forced to rethink how they find workers. The situation could keep pressure on the Fed to raise interest rates despite a global economic slowdown. The Labor Department on Tuesday is to release the latest data on job openings, from November. The report follows data released last week showing a surge in job growth in December and could help central bankers assess sometimes conflicting anecdotal reports about how hard firms must work to fill jobs. Economists say the most convincing signs of labor shortages would be a surge in wage growth. While average hourly earnings rose 3.2 percent in December, that is tepid by historical standards. 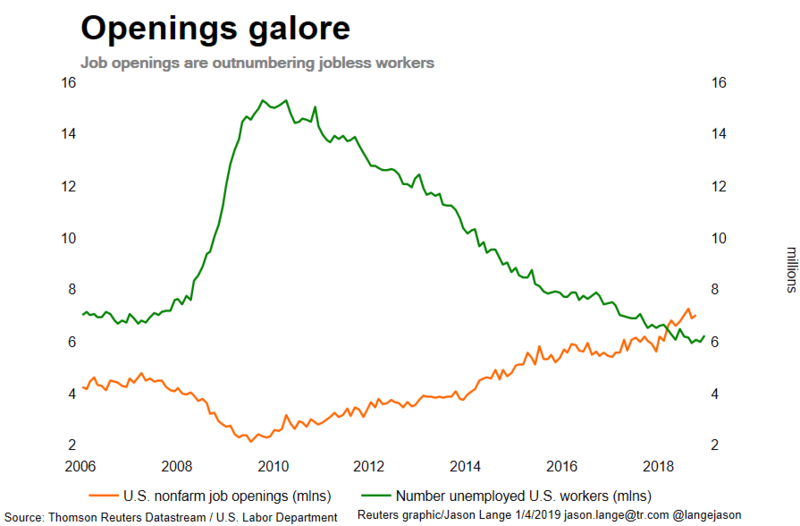 But the combination of increasing job openings and falling unemployment around the country is making a more convincing case of a tighter U.S. labor market. "If this goes on for another couple of years, then yes of course we'll be running into labor shortages," said Ryan Sweet, an economist who tracks regional economies at Moody's Analytics. In some places, the labor shortages are already here. Shaw Industries, headquartered in Dalton, Georgia, is growing so quickly that finding good talent "can be challenging," says Brian Cooksey, director of workforce development. The flooring company, a unit of billionaire investor Warren Buffett's Berkshire Hathaway Inc conglomerate, is funding programs in local high schools and even middle schools to get students interested early in the high-tech manufacturing in which Shaw specializes. In other places, it is a different story. Last year auto parts supplier Lear Corp held a job fair in Flint, Michigan, to recruit 400 workers for a new factory set to open in April. Some 3,000 people showed up. "We were totally blown away," said Lear CEO Ray Scott. In October, there were 7.1 million job openings nationwide, about 1 million more than the number of unemployed workers. The spread was widest in the Midwest, where there were 463,000 more openings than jobless workers, and in the South, where the spread was 317,000. The spread was 77,000 in the West and 51,000 in the Northeast. All four regions have all had a surplus of job openings only since July. Industry-specific data on openings is not available by region, but the recent surge in the South likely derives from sectors doing well there, like retail and construction, said Sweet. Strong demand for U.S. factory goods in 2017 likely helped drive job creation in the Midwest, although a global economic slowdown and the China-U.S. trade dispute could hit that region's factories this year, dampening openings. Fed policymakers say they are nearing the end of a long campaign of gradual interest rate hikes designed to keep the economy from overheating. Policymakers do not know how much the slowing global economy will undercut a strong U.S. labor market. The jobless rate has trended lower for nearly a decade and while Friday's data showed it ticking higher due to growth in the labor force, it remained near a 49-year low at 3.9 percent. U.S. central bankers worry a tight labor market will eventually lead to higher inflation. 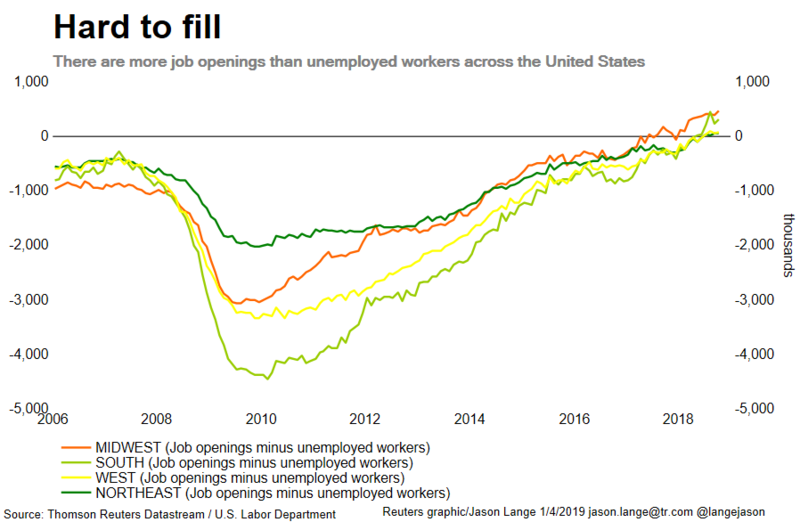 With wage gains still tepid and inflation under the Fed's 2 percent target, the job openings data could add heft to anecdotes detailing labor shortages collected by the Fed in recent months as part of its Beige Book report. "It certainly reinforces the case for the Fed to try to stop the downward trend in the unemployment rate" to keep inflation in check, said Jim O'Sullivan, an economist at High Frequency Economics.